We are committed to breed, protect and distribute Rhino in Africa. of approximately 20 Rhino from which a custodianship program can be launched, distributing new founder populations of rhino throughout Africa. Our Mission: To employ counter poaching training and cutting edge technology to breed, protect and distribute Rhino in Africa. The initiative ran its first training course in February 2017 at Camp Charleston, the foundation’s new onsite training facility. The first course trained eight local general workers in the field of counter insurgency. This course offered skills to individuals on fence maintenance teams to enable them to provide valuable input and assistance to anti-poaching units during their day-to-day patrolling of protected areas. This training is a perfect example of empowering people to contribute to the protection of our treasured natural resources. The training was made possible through the kind donation of Sportingbet. The second course sponsored was a five-week Security Ranger Program which took place in March/April 2017 at Camp Charleston where eight candidates working in private and public parks attended. This training provided these individuals with the necessary qualifications and skills to be legal and competent security rangers in protected areas and game reserves. The foundation plans to sponsor three courses this year. The poaching of Rhino in Southern Africa and in South Africa in particular has been increasing exponentially over the past five years. In 2013 more rhino were killed than born. In an effort to combat this increase in poaching incidents the Gondwana Conservation Foundation launched the Rainbow Rhino initiative. The initiative’s objectives are to employ counter poaching training and cutting edge technology to protect and distribute Rhino in Africa. The initiative will establish a best of class counter poaching training facility based on Gondwana Game Reserve and combine both traditional counter poaching training practice together with cutting edge technology such as drones and satellite tracking devices. The initiative believes in changing the face of rhino conservation using technology and social media as a platform. The Rainbow Rhino initiative plans to introduce over 60 individual rhino into various reserves in Africa over a 10 year period. Within this period it is estimated that over 85 rhino calves will be born and that the foundation will have over 180 rhino to distribute to suitable locations in Africa. The foundation has a goal of working with conservation authorities where a package deal can be created. This package deal will include the deployment of a highly trained counter poaching unit together with a viable breeding herd of rhino to viable settlement areas. We believe that the loss of the Rhino is a global issue and we all need to join hands to resolve it. 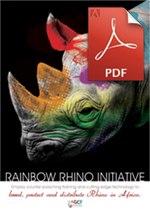 The foundation has thus launched an international fundraising initiative to contribute to the development of the Rainbow Rhino initiative. Rhinos in the wild will be extinct by 2020 – If the levels of poaching continue, experts have warned. Don’t buy rhino horn products! Illegal trade in rhino horn is a continuing problem, posing one of the greatest threats to rhinos today. Spread the word! 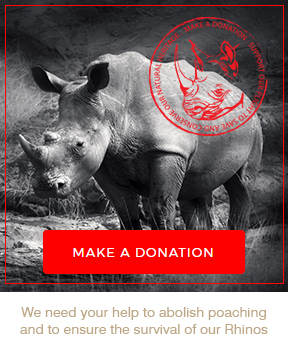 This rhino poaching epidemic needs everyone’s help to stop it!